Play Days: Get Up to 50 Percent Off Select PlayStation 3 Accessories! We hope you had a great time celebrating the holidays with family and friends. We have some great news to keep the holiday cheer coming. 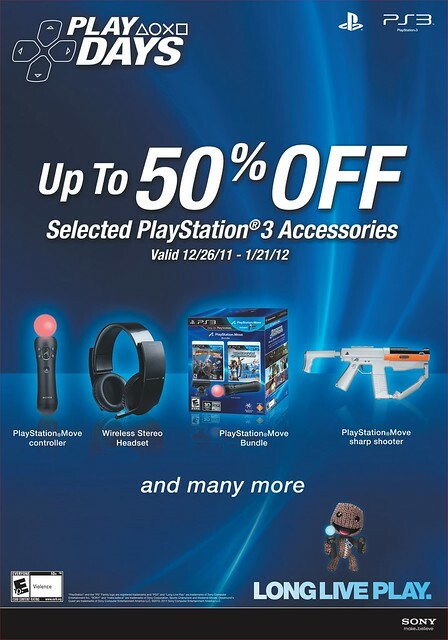 What better way to rejoice in the upcoming New Year than to get great deals on some of your favorite PS3 accessories? Starting today through January 21st, you can check out our new “Play Days” promotion at most of the major retailers. 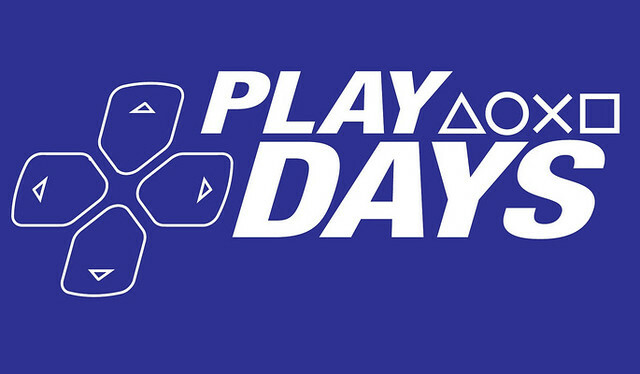 Play Days offers you significant savings on selected PS3 accessories at up to 50 percent off. The PS3 system provides a great entertainment experience on its own, with high-definition gaming and other great features like video streaming and access to a huge library of movies, games, and shows via the PlayStation Network, but PS3 accessories add another great way to enhance your gaming and entertainment experience. PlayStation Move accessories that allow you to be part of the fun though a completely immersive and realistic motion gaming experience. We’re very excited to deliver even more savings to you this holiday season. Which accessory are you looking forward to playing with? For exact promotional prices, please check at the participating retail stores. I have been looking for a good reason to buy the PS move looks like this payday! Will there ever be an option to purchase accessories and other non digital download merchandise through the PSN store? If i have the funds in my wallet for a new controller, it’d be cool to just buy it through there. Ugh, when I read “Up to 50% off” I got excited… then looked at all the prices… not much savings there I’m afraid… especially with the headset of which I was interested. This is a great opportunity for gamers to pick up the latest gear so don’t miss out! Seems like a good time to pick up a sharpshooter. Playstation 3D Display – Reg $499.99, boxing day sale $299.99 @ Toys R Us, Futureshop, Bestbuy and Walmart. There’s your 50% off deal and a steal too. The wireless key pad was $49.99 on release, so I’m a bit confused about that (I bought one on release). Otherwise, awesome deals! At first I was going to say “LOL the wireless keypad was always $50. You’re not fooling us with one of those Groupon fake regular price Save 93%!!!! !” scams that’s so popular today. The Sharpshooter dropping from $40 to $20 is the only item that’s 50% off. Not much for me to grab except for that remote that’s on $19.99. Any word on Canada for accessory sales? I got the wireless headset a couple of months ago and think they are awesome. I got a pair of expensive Sennheiser and I prefer to use the playstation wireless headset when I can. You can only use it on the Playstation 3 and the PC (maybe mac too?) though as it works through a bluetooth dongle. Boo, I was hoping that the Dualshock 3 itself would get a discount, looks like I’m not getting anything on that list. FINALLY! $100 even doesnt sound as good as $89.99 for the Wireless Stereo Headset. Im not even kidding, most people will think this is sarcasm. Between giftcards and returns ill be able to snag that puppy for $20 out of pocket. Thank you Sony for the -$10 offer. Picked up the 3D display today from Future Shop for $299.99! Might wanna add that lol. @Genexi2: If you check the Canadian equivalent of some of those retailers (e.g. Best Buy or EBGames) they’ll have the same discount. You may find better deals elsewhere though as it’s boxing day/week. Certain retailers may also price match so you could save another 10%. If any Canadians are interested in the wireless stereo headset it is being sold thesource.ca for 74.99. I thought “WOW” after reading the title. My excitement died after reading the post however. What an underwhelming sale. You could have at least had a Dualshock 3 for half off. Ultra Mega Weaksauce this sale is. Ok, so I went to gamestop took back some stuff, and the cashier gave me the Wireless Stereo Headset for $49.99!!! It is BEAST. Yup… People are getting the Wireless stereo headset for 49.99 and also 50% off on 3d Glasses.. at Gamestop, Hope the offer stays till tomorrow..
Great Deal I hope they don’t sell out too soon. Great prices and all. Good Job Sony!!!!! I got 3 headsets at Gamestop for $49.99. Best deal this Christmas : ). No love for Walmart? I work there. 10-percent employee discount, plus these deals would make my debit card happy. I saw the title and got a little curious and excited, but then I saw the prices. Months ago Gamestop had a the Move accessories for 50% off and with that I was able to get another move set. Got the move controller, navigational controller, and a 2 unit charging base for if remember correctly $60. That was a much better deal then this. Sad part is that I haven’t really used the 2 move sets that much even though I do have a few move compatible games. I was really hoping the dualshock would be on sale. I need a new one. I still have a six axis that has been abused. DUALSHOCK®3 Charging Station. It seems most of your stores listed didn’t get your memo. They are still showing around $24.99. I picked up a contoller, a blue tooth headset and a keyboard and saved $40 at Best Buy. Ordered online and picked it up at the service desk an hour later. Nothing on this list is 50% off They say its 50% off but then make there own prices down below. I still don’t see 1 item on this list that is 50% off what kind of joke is this? this is SWEET it’s about time Playstation did a sale to this extent, LONG LIVE PLAY INDEED! You might want to let Best Buy know about that regular price you have listed for the 6.5′ HDMI cable. They’ve been selling them for $49.99 since they got them in stock. The new wireless headset is $79 at my store… i’m tempted to get it, even though i don’t talk online much and the build quality is questionable… hmm..
Ooooh! Newegg.com has the headset for $75! Very tempting. I’ve never payed that much for a headphones before and I don’t play online very often, and never competitively, so that’s still kinda steep for me. I’d just like to play without disturbing others. The whole simulated 7.1 almost sells it for me because I don’t think plugging into the RCA out (with dongles and converters and what not) does the system justice… I hope I’ll be able to see it at $50 -$60 one day. Then I’m there! One thing is 50% off… what a farce. I wish bundels were sold because i need a remote,playstation move,and games. Why aren’t the Dualshock 3 wireless controllers on sale ? So, got this awesome deal at best Buy, so far I bought the Wireless Headset as seen in my comments above, but I still wanted to take advantage of this deal. I looked at Best Buy and found a PS Move Mayhem Bundle. Two great games and alot of good accessories (PS Eye, Move and Move Navigation, and PS Shooter!) Great deal, all controllers are synced and charging! Cant wait to play some of this stuff.